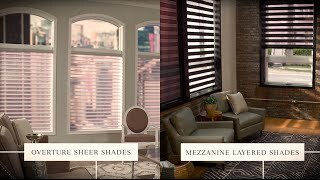 We have quality window treatments from Hunter Douglas and Graber! If you’re looking to add high-quality window treatments to your home setting, be sure to visit Buddy Carpet One in Nashville. We offer a great selection of window treatments in our showroom, and we also have a team of talented designers who’ll help you make the perfect choice. Window treatments such as blinds, shutters, and shades are considered hard window treatments because of their constructions. They are made from wood, metal, or composite, and as such they are rigid and durable. Hard window treatments can regulate sunlight, increase privacy, and even muffle outdoor noises. There are also window treatments, including curtains and drapes, that are made from fabrics. These soft window treatments aren’t as functional as hard window treatments, but they offer greater design versatility. As part of our selection, we offer window treatments from Hunter Douglas and Graber. We have blinds, shutters, shades, fabrics, and pretty much any option you may have in mind. To learn more about our window treatments, contact Buddy Allen Carpet One Floor & Home in Nasheville, TN. Graber emphasizes style and performance throughout its entire line of window treatments. Graber blinds are definitely the most popular option, but you can also choose from shades, shutters, and fabrics. Fabrics are perfect for homeowners who want to add warmth and comfort to their settings. Hunter Douglas continues to be one of the most popular names in the industry. Why? It relies on innovative product performance technologies that you simply won’t find anywhere else. Each Hunter Douglas window treatment is made from quality materials, so they are certainly built to last in any household.